If you’re looking for a short getaway that takes you far away from the city and into the lap of nature, this Dhanaulti adventure camp is the perfect destination for you. For 2 days among the green mountains of Uttarakhand, you'll stay in comfortable Swiss tents and enjoy a roster of adventure activities on offer, from air rifle shooting and zorbing to rappelling and paintball. The campsite also offers indoor games like chess and carom and outdoor sports like badminton and volleyball. In the evening, you'll gather around a crackling bonfire with your family or group of friends and spend a merry night outdoors, under the starlit night sky. Please note that a minimum of two travellers are required to book this Dhanaulti adventure camping trip. A hill-station perched atop the foothills of the Garhwal Himalayas in Uttarakhand, the town of Dhanaulti, at an altitude of over 8,500 feet, offers mesmerizing views of rolling mountain slopes and meadows. Your campsite in Dhanaulti, surrounded by thick virgin forests of deodar, oak and rhododendron, is located over terraced farms on a mountain slope, offering the perfect backdrop for a short, adventure-packed vacation in Uttarakhand. At the campsite, you'll be staying in comfortable Swiss tents that come with an attached bathroom with running water, comfortable bed with mattress and beautiful views of the endless mountains at the doorstep. Delicious meals will be served at the common dining area of the campsite. • Participate in adventure activities like rappelling, rock climbing and more. • Spend the night around a merry bonfire under a starlit, night sky. 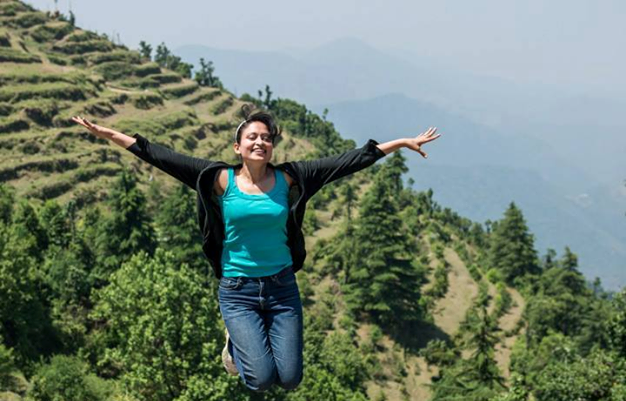 • Escape the urban crowd for two days in Dhanaulti. • Sleep in comfortable Swiss tents with scenic views. A basic level of health and fitness is required to book this Dhanaulti adventure camp. Travellers with pre-existing medical conditions are advised to consult with their personal physicians before booking this trip. Travellers are required to follow instructions of the activity guides while undertaking any adventure activity at Dhanaulti. For cancellations made 30 days or more before check-in date of the Dhanaulti adventure camp: 70% refund. For cancellations made 15-29 days before check-in date of the Dhanaulti adventure camp: 50% refund. For cancellations made 7-14 days before check-in date of the Dhanaulti adventure camp: 25% refund. For cancellations made less than 6 days before check-in date of the Dhanaulti adventure camp: no refund. There is no pick-up for the Dhanaulti adventure camp. There is no drop-off for the Dhanaulti adventure camp. Day 1 of the Dhanaulti adventure camp: Check-in and enjoy! Arrive at the Dhanaulti campsite and check-in to your Swiss tents by noon. You'll be greeted with a welcome drink on arrival. 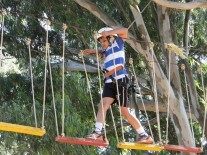 After a delicious lunch, you can participate in one of the many adventure activities at the campsite. From air rifle shooting and zorbing to rappelling and paintball, you can spend the afternoon enjoying with your group. Take a break for evening snacks. The campsite also offers indoor games like chess and carom and outdoor sports like badminton and volleyball. In the evening, you'll gather around a crackling bonfire with your family or group of friends and spend a merry night outdoors, under the starlit night sky. Retire in your tents after dinner. Overnight in Swiss tents at the Dhanaulti campsite. After a lazy morning at the campsite, have a late breakfast and pack-up your luggage. Check-out time at the campsite is 11:00 hrs. Your trip ends here. Overnight in Swiss tents at the Dhanaulti campsite. Check-in time at the campsite is 12:00 hrs. You'll be accommodated in Swiss tents with attached washrooms, comfortable beds with blankets and pillows, chairs. Today's meal package includes lunch and dinner only. You'll also be served a welcome drink on arrival, as well as snacks with tea in the evening. 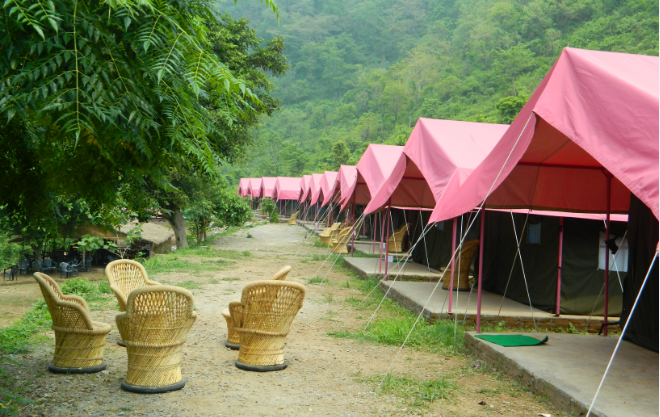 The campsite, accessible via road, is located 90-km/3-hr drive from the Rishikesh railway station and the Dehradun airport, 65-km/3-hr drive from the Dehradun railway station.